Are your pups escape artists? It doesn’t matter how attentive of a dog owner you are; there are some dogs who are simply burrowers. It can be absolutely frustrating to have to keep filling in holes and explaining the situation to your neighbors. But that doesn’t mean that you just have to live with the situation. There are many things that you can do to avoid the escape of your pets. Though there may be an investment of money and time initially, it will still save you money and frustration over time. Most dogs will only burrow so deep. Go around the underground perimeter of your fence with rocks, bricks, or even concrete fill. Now, your dogs may still be able to dig underneath the barrier eventually, so you will need to check periodically to fill in holes. But the benefit to this strategy is that you will be able to notice before your dog gets through the barrier and it will be an entirely invisible solution. Of course, it also does require a lot of work. One of the simplest ways to keep your canine companions contained is to extend the fencing into the ground when it is first being installed. By extending your fence into the ground by a foot or two, you can increase its stability while keeping your pups fenced in. At Fence Specialists, fences can be installed in various ways to ensure the safety of your beloved pets. Need a quick and affordable fix? One thing you may have noticed is that dogs will go back to specific areas to dig. If you want to defeat them quickly and easily, drop paving stones or bricks directly onto the areas that they’re digging at the most. This will often be enough to distract them away — at least long enough to come up with a more permanent solution. Most dogs will dig out of boredom, so adding complications will also give them something new to figure out. 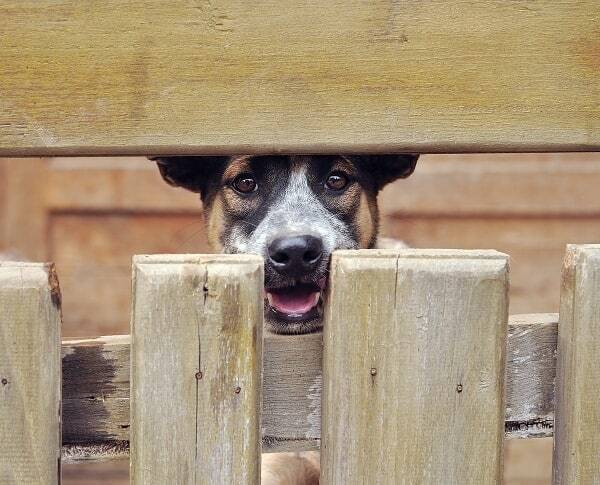 If your dog continues to dig under your fence, it may be a behavioral issue! Consider adding some toys and activities to your yard so that they aren’t as bored. Of course, some dogs simply burrow instinctively, and there isn’t anything you can do: it’s just what they are bred to do. Consult with Rustic Fence to find out more about your options.